About my Filet Crochet patterns . . .
My filet crochet graphs are large and easy to read. Each pattern comes with starting instructions, a list of materials used, approximate finished size in inches, gauge, and details on reading the graph. When you purchase my design you agree to the following . . .
1. You do not have permission to share my patterns. 2. You do not have permission to save my patterns to your computer. 3. You are allowed to print 1 copy of the purchased pattern. 4. You may not use my patterns to teach classes without written permission from me. 5. You do not have permission to mass produce my patterns. 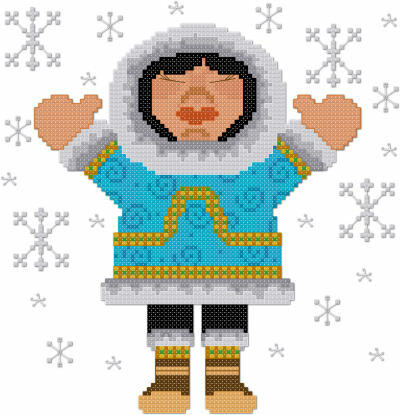 - Choose this option if you would like PolarBeads.com to print your pattern and mail it to you via Priority Mail. There is a printing fee of $0.25 per pattern. - Choose this option if you would like to download the pattern in PDF file. You will need Adobe Acrobat Reader 3.0 or higher. Choosing this option means that you will have to purchase and download each pattern seperately. There are no additional charges with this option. Simply pay and print.